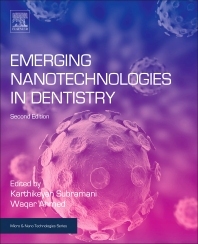 Emerging Nanotechnologies in Dentistry, Second Edition, brings together an international team of experts from the fields of materials science, nanotechnology and dentistry to explain these new materials and their applications for the restoration, fixation, replacement or regeneration of hard and soft tissues in and about the oral cavity and craniofacial region. New nanomaterials are leading to a range of emerging dental treatments that utilize more biomimetic materials that more closely duplicate natural tooth structure (or bone, in the case of implants). Each chapter has been comprehensively revised from the first edition, and new chapters cover important advances in graphene based materials for dentistry, liposome based nanocarriers and the neurotoxicity of nanomaterials used in dentistry. Assistant Professor of Dental Medicine at Roseman University of Health Sciences, USA. He was the recipient of the prestigious 2006 Andre Schroeder Research Prize from Straumann (Switzerland) for his innovative research findings during his Biomedical Nanotechnology degree program in the United Kingdom. Dr. Subramani was involved in the International Team for Implantology (ITI) funded research projects in Switzerland, the Netherlands and in the USA. He has authored numerous peer-reviewed research papers and review manuscripts and has authored numerous book chapters. He is also the editor of the Elsevier book Nanomaterials in Clinical Dentistry together with Waqar Ahmed.